This week in the war, on 26 March 1942, a force of British commandos left Falmouth in Cornwall on board a flotilla of destroyers and motor-torpedo boats heading for the German naval base at Saint-Nazaire on the Loire estuary on the western coast of German-occupied France. The British ships included the destroyer HMS Campbeltown, an old American destroyer that had been one of fifty transferred to the Royal Navy in 1940 as part of the ‘destroyers for bases deal.’ Several tons of explosives had been packed into her bows. The object of the mission, coded named Operation Chariot, was to destroy the dock gates at Saint-Nazaire. As of January 1942, the Bismarck‘s sister ship, Tirpitz, was fully operational and the British admiralty feared a repeat of the Bismarck’s foray into the Atlantic. If the Tirpitz headed into the Atlantic and returned to port in Western Europe for repairs, the only dry dock large enough to take her was the one at Saint-Nazaire—hence the importance of its destruction. 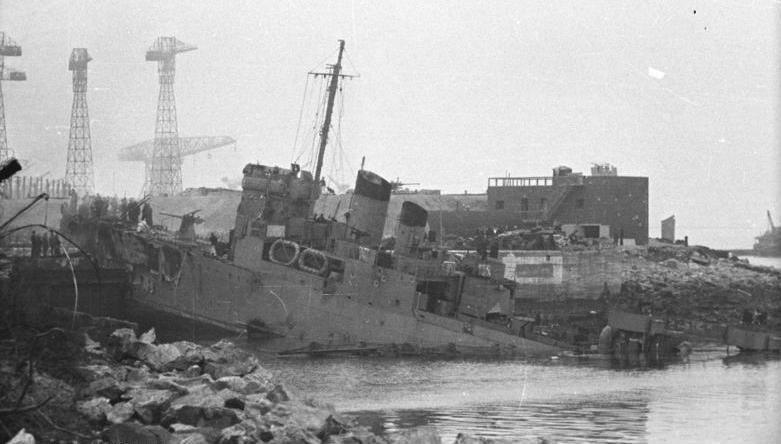 In the early hours of the morning of 28 March 1942, HMS Campeltown—flying a German naval ensign as a ruse de guerre—smashed through the harbour boom defences and, while under heavy fire, rammed the dock gates at full speed. Commandos landed from the Campeltown and from launches and began blowing up harbour installations, including the pumping station and machinery for operating the gates. Because of the (possibly faulty) timing mechanism on the fuse, the explosives aboard HMS Campeldown did not detonate till noon. When they did so, the dry dock was utterly destroyed and over three hundred men were killed. They included a party of senior German officers who were on board for an inspection tour. Of the approximately 600 British commandos and naval personnel who took part in the Saint-Nazaire raid, slightly over on third returned to England, slightly over one third were captured, and somewhat under one third were killed. The lock gates were never rebuilt and the German battleship Tirpitz never risked venturing into the Atlantic. She was sunk by the RAF in late 1944. This entry was posted in World War II and tagged HMS Campeltown, Saint-Nazaire, St. Nazaire, Tirpitz. Bookmark the permalink.